A pair of University of Chicago students discovered a way to interact with proteins—and in the process compose unique scores. Josiah Zayner adds drops of the protein AsLOV2. During his years as a grad student in biochemistry at the University of Chicago, Josiah Zayner spent a lot of time thinking about proteins. But they still remained somewhat abstract. "A protein is very tiny and small," he says. "You can't touch it or feel it or interact with it. I began thinking that if you could interface biology with electronics, you might be able to interact with proteins." Zayner was working with a group of plant proteins, called phototropins, that respond to light. If he could use light to trigger a reaction in those proteins, he thought, maybe he could harness that reaction and use it to produce something tangible, like a sound. Or music. He began looking around for someone who understood both music and electronics and found Francisco Castillo Trigueros, a composer and fellow PhD student. 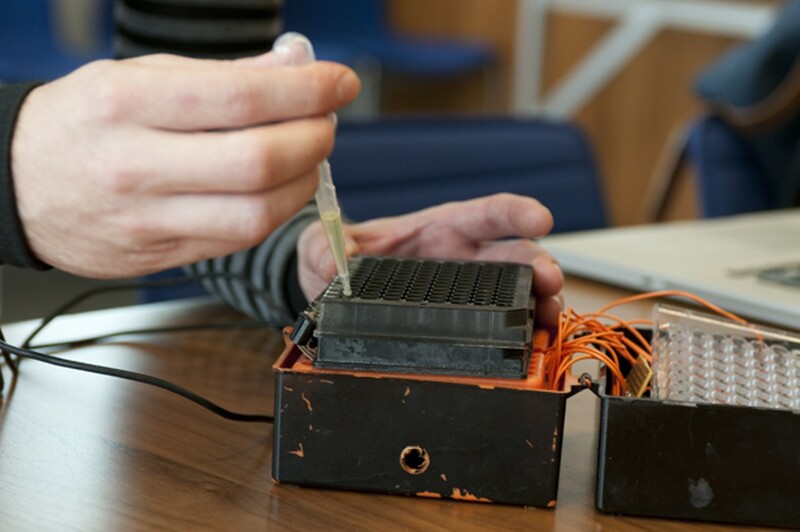 After several months of trial and error—"It's more difficult to build a scientific instrument in your apartment than you'd think," says Zayner—they came up with the Chromochord, the world's first biologically powered musical instrument. 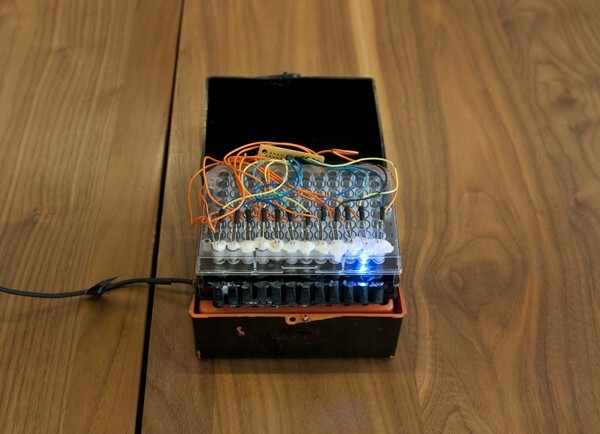 The Chromochord is a small black box that contains a microprocessor and 12 little wells. Each well contains a few drops of a protein called AsLOV2. Zayner genetically engineered several different varieties, each of which reacts to light in a different way. Some respond quicker than others, some more dramatically. Two or three different versions of AsLOV2 can go in the Chromochord at a time. Castillo Trigueros created what he calls a "musical event" to coincide with each well; the protein in the well determines how long or loud the music gets projected. Then he composed a score. To play the Chromochord, Zayner and Castillo Trigueros hook up a laptop to the microprocessor. "We program the score," Castillo Trigueros explains, "the pattern of lights that trigger the proteins." And then the music comes out through the computer. It's the nature of proteins to degrade over time. In the Chromochord, it takes about five days. First the sounds become less distinct. Then they fade into white noise. "Because of the breakdowns, it sounds different every time," says Castillo Trigueros. "It's like interacting with a human," Zayner adds. "You don't know what's going to happen." Last year, Ryan Twose founded the Chicago chapter of the Association of Unmanned Vehicle Systems International. Of the ten to 15 harmonicas Bob Kessler plays, the one that's the "size of a large sandwich" is likely the most bizarre. Steve Sullivan of the Peggy Notebaert Nature Museum explains that the long-extinct bird was hunted so rabidly it wasn't able to reproduce at a high enough rate. It was nearly four decades ago that Ed Wesly saw his first hologram created by lasers—and he's been addicted ever since.